The dress season has finally arrived, I am loving the beautiful sunshine and I’m looking forward to the bikini season in a few weeks! I usually use an epilator to keep my legs smooth, but I have been trying Nair Argan Oil Roll-on Wax lately and it is great! To prevent ingrown hair, exfoliate once a week and moisturise the skin every day. To soothe your skin after removing a wax strip, immediately place the palm of your hand on top of the waxed area, applying little pressure. To soothe the freshly waxed area, apply a moisturising cream or oil. The makers of Nair never stop seeking new ways to make skin smoother; so they’ve tapped into one of natures’ most valuable assets by infusing liquid gold Argan Oil into their latest launch. Argan Oil is a source of inner and outer beauty that delivers powerful benefits, including soft, supple and glowing skin. It is known to protect, detox, heal, nourish and soothe the skin with properties that include antioxidants, Vitamin E, anti-inflammatories and natural softening agents. Enriched with Orange blossom Extract this professional, easy to use resin wax formula, heats in just 25 seconds and will leave you feeling silkily smooth for up to four weeks. The kit includes a 100ml bottle of Nair Washable Roll-On Wax with applicator, 10 washable, reusable, non-woven strips, an instruction leaflet, which should be read prior to each use and a stand. 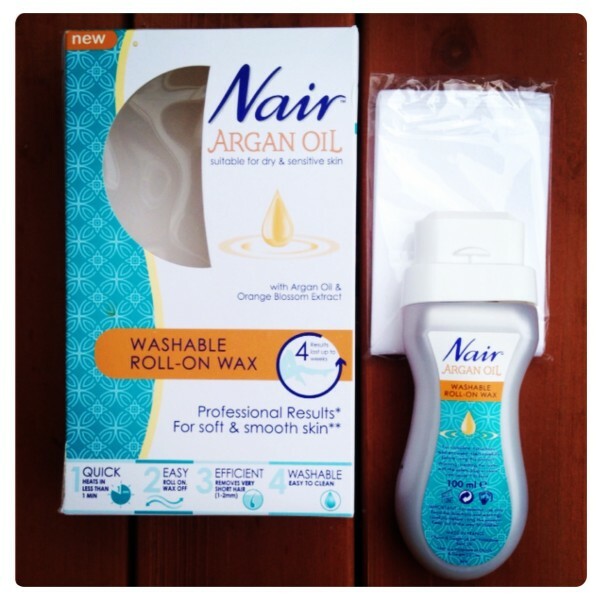 Nair Argan Oil Roll-On Wax combines a practical, washable, reusable Roll-on applicator and an exclusive formula that can be rinsed in water; delivering all the benefits of super salon smooth, nourished and hair free skin whenever you need it. 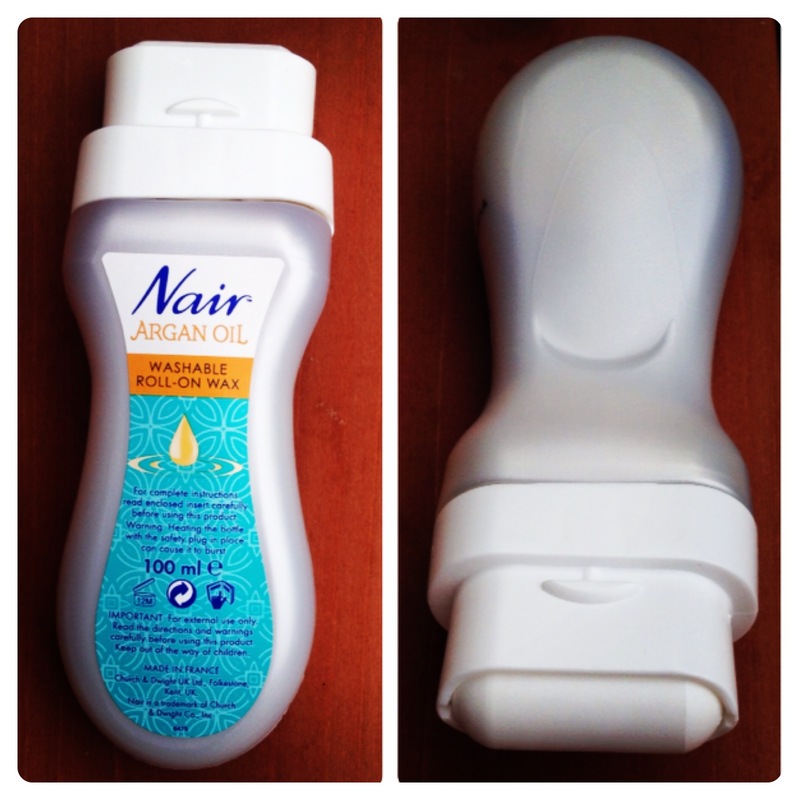 Nair Argan Oil Washable Roll-On wax, sponsored the smooth legs seen at Jean Pierre- Braganza’s SS/14 LFW show, and will take just moments to remove the shortest of hairs. The built in wax applicator delivers an even layer of warm wax and can remove hair as short as 1.5 mm. I really like Nair Argan Oil Roll-On Wax, it is practical and convenient, itcan be used on legs, underarms and the bikini area, so it is perfect to keep you hair-free this summer! It is available at RRP £12.99 from Boots, Superdrug and Tesco. For full guidance for safe use please refer to the leaflet in the pack. For your chance to win Nair Argan Oil Roll-on Wax, please fill in the Rafflecopter below. You MUST leave a comment and subscribe by email (compulsory entries), you can also gain extra entries by tweeting (daily entry), subscribing to other social media channels, etc. 129 Responses to "Top Tips for Smooth Legs + Competition to #Win Nair Argan Oil Roll-on Wax"
Keep them fuzz-free with hair removal cream. Shaving, for me at least, can cause irritation – not a good summer look! Exfoliate regularly and moisturise with sun protection. Moisturise every day after bathing or showering. Wear jeans so nobody can see them. Or wear a big smile people focus on that rather than any imperfections. Exfoliate and moisturise daily and if you have pale legs wear self tan or tinted moisturiser and a little colour makes them appear slimmer! Get a really good Moisturiser! Always use a thick body butter. For me a good quality, well applied fake tan! Use a body brush before you get in the shower then exfoliate and moisturise for silky smooth legs. Relax; stress is the first step to dry, unhealthy skin. Lots of moisturiser and drink lots of water to keep all your skin clear and hydrated. I’m a guy. My tip for great legs is therefore SUNSCREEN. Don’t get burned. Use hair removal cream and a coconut moisturiser, looks great and smells like you’re on holiday! Exfoliating on dry skin is really effective. exfoliate and moisturize, and don’t forget those heels need to be smooth for summer sandals! Vary heel heights each day for killer calf muscles! use a tinted moisturizer or a bronzing one to help give you that summer glitter. Good scrub in the shower! Has to be use a moisturising shower gel or bubble bath to keep legs smooth befoee and after hair removal. Tinted moisturiser, as I am paler than pale! !